Assistant Curator is a multi-faceted position supporting the realization of the Gallery’s ambitious exhibition schedule, and coordinating the public programs accompanying the exhibitions. Reporting to the Gallery Director, the Assistant Curator will research and assist in the development of the contents of the exhibitions including developing checklists, negotiating loans, and managing the administration related to the exhibitions. S/he creates interpretative materials, printed matter, and publications in coordination with the Gallery Director, guest curators and external partners. The position has lead responsibility for the educational programming related to the exhibition, and working with other departments, docents, and museum educators on the education programs. The Assistant Curator must be a team player. S/he must be an excellent writer able to produce educational and promotional materials to outreach to a broad audience. She/he plays a critical role in liaising between various department at Japan Society, and in building relationships with institutional partners, funders, and supporters of the Gallery. Responsible for assisting the Director of Programs in supporting all agency programs with administrative, contract, and reporting functions. This position provides administrative support to the Director of Programs. Assist with submission of grant proposals, coordinates grant and contract reporting in accordance with contract deadlines. Creates standard and customized reports utilizing several different applications/databases. 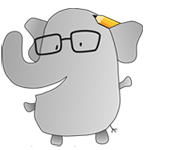 Prepares and does minor editing of reports, grant proposals, and meeting minutes. Establishes, maintains and revises record-keeping procedures and files as directed. Provides back-up support to program staff colleagues as appropriate. Assist in developing and scheduling trainings for program staff. Provides administrative support and coordination of specific tasks as assigned by the Director of Programs. 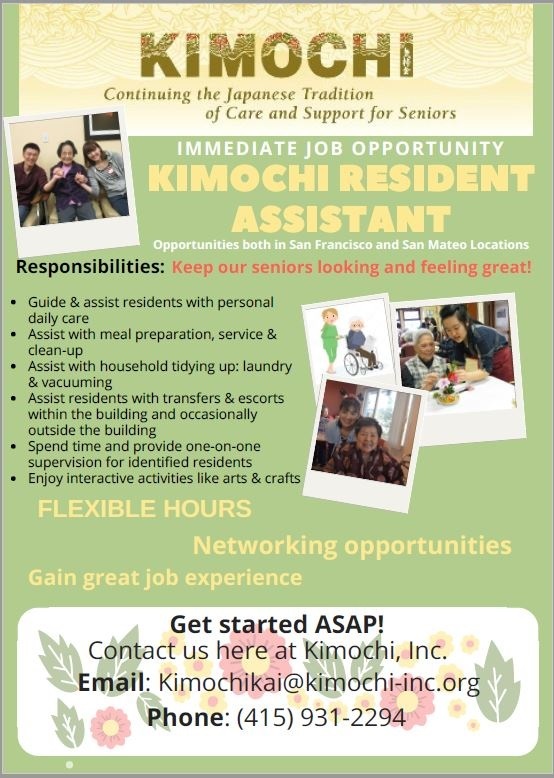 Assists the Kimochi Home Administrator in the administration and daily operation of assigned Kimochi, Inc. licensed residential care facility for the elderly. This position reports directly to the Kimochi Home Administrator. This position provides direct supervision of direct care staff. Manage day-to-day operations of assigned Kimochi, Inc. licensed RCFE. Train, supervise, and evaluate facility direct care staff. Prepare monthly work shift schedules to ensure adequate staffing in accordance with agency policies and procedures and state law. Director of Residential Services in CADL compliance audits. Coordinate resident services including activity schedules, pre-admission interviews, conducts initial and annual assessments, and individual service plans. Collects residential fees, maintains resident’s files and records in compliance with regulatory agencies. Coordinate and order medications, food, and non-food supplies for the facility. Monitors and coordinates building and equipment maintenance needs. Reports incidents to the Kimochi Home Administrator, appropriate government departments, including the Ombudsman, as needed. The CEO of an advertising company is looking for a female bilingual assistant for the company’s office in Tokyo. This is a good position for applicants interested in fully utilizing their language skills as well as furthering their career in the advertising field. Applicants should speak fluent English and Japanese (N2 and above). This company is an advertising agency, producing a variety of original media such as television programs, magazines, as well as organizing a top leaders’ membership club. With the possibility of expanding its existing media overseas, the company is looking for a female assistant to the CEO to assist with translation of media, help out at production sites, as well as bringing unique and diverse ideas to the workplace. Japanese/American Companies seeking candidates nationwide. Japanese language or cultural background is a big plus! All of our positions are direct-hire with company benefits! See below a small listing of some of our urgent job openings! The Embassy of Japan is seeking a highly motivated, team-oriented individual for the position of Diplomatic Assistant/Scheduler for the Congressional Affairs Section. The position provides an excellent opportunity to work for a foreign diplomatic mission while gaining insight into international affairs and its relation to the U.S. Congress from a unique inside perspective. Please see below for a detailed list of responsibilities. The Embassy offers group health insurance coverage, paid vacation and sick leave. Working hours are 9:00 am – 5:30 pm, Monday through Friday, with lunch time receptionist duty once a month and opportunities for paid overtime by occasionally working at evening and/or weekend events. Salary is commensurate with experience. Posted by: ITOCHU International Inc.
Itochu’s DC office has a job opening for someone with strong Japanese skills and research/analysis experience. Job Summary: Key member of the Washington Office policy research team providing advisory services for ITOCHU International Inc. and ITOCHU Corporation. Applicant will have excellent general research capabilities with the ability to cover a broad portfolio of issue areas and have the desire and capability to engage in business development opportunities. Applicant should have excellent written and verbal communication skills and the ability to quickly distill and analyze large volumes of information in a concise manner. About Us: ITOCHU International Inc. is the North American flagship company of the ITOCHU Group. ITOCHU provides trading services for more than 20,000 items and manages a portfolio of more than 20 subsidiaries and affiliates. Established in New York in 1952 and headquartered in midtown Manhattan, ITOCHU has various offices from coast to coast in the United States, as well as operations in Canada and Mexico, and is staffed by approximately 160 employees. Its subsidiaries employ thousands more. ITOCHU operates in a wide variety of businesses, with particular strength in the machinery, energy & chemicals, electronics, food, forest products, chemicals and textiles sectors. ITOCHU and its subsidiaries have assets of nearly $1.7 billion and annual revenues of over $3.6 billion in the last year. ISA (International Studies Abroad) Tokyo is currently seeking an on-site Custom Programs Assistant in Tokyo, Japan. This is a full-time position. The ISA Custom Programs Assistant will be responsible providing a comprehensive array of services to ISA and WSISACP students in Tokyo. Willing to work odd hours and weekends and be on call 24 hours a day while program is in session. The U.S.-Japan Council is hiring for a new COO position in their DC office. Please find the attached announcement below and follow up as per the application instructions. Do you speak Japanese, love working with children, and need a fun and interesting gig for the summer? Mori no Ike, the Japanese Language Village at Concordia Language Villages–an immersion-based summer program based in Minnesota, part of 15 languages–is still looking for several staff members for 2019.